On last night's episode of The Big Bang Theory my wife, Donnie Payne, and I made our network TV debut. As I mention in my previous post they shot the studio audience for the vanity card that airs at the end of each show. Yesterday I posted some rough pictures of our admittedly brief network TV appearance on Twitter by freezing the image on my TiVo and then taking pictures of our TV with my digital camera. Today the show’s producers posted the full blown images on their website. This is the actual vanity card that aired. You can see us sitting in the second row on the far right of the picture. Heather is the rose between the thorns wearing the orange top. This is our area blown up. We had a lot of fun with the guy sitting in front of me. His name is Josh. He was more VIP than we were as he got to go down on the stage itself after the taping was over. You can tell they had to edit multiple still shots together in order to get this panoramic image. Even with that they still left the far ends of the audience out. You can see us clearly on the far right of the image in the second row. We had great seats right in front of Penny’s apartment. A taping of "The Big Bang Theory"
Warning: This post contains some spoilers relating to the plot line of “The Big Bang Theory”. Proceed at your own risk. A few weeks ago I was in the Los Angeles area for a conference. Knowing that I was going to be in LA I started looking around for tickets to a few of my favorite TV sitcoms. One of my favorite shows right now is The Big Bang Theory on CBS. This is a show about 4 scientists who are also major computer, Star Trek, Star Wars, and comic book geeks. I like the show because my wife says I am parts of all 4 geeks. My wife likes the show because she is married to parts of all 4 geeks. After looking around for tickets it became apparent that due to the show’s popularity that I wasn’t going to be able to get a ticket without some inside help. You can see this blog post for where my inside help came from and how we scored VIP tickets to the taping. We arrived at Warner Bros. Studios in Burbank, CA at 5pm on Tuesday, March 9. We checked in as “guests of the production” and were moved to the front of the line. At 5:15pm they escorted our group of about 20 from the parking structure to the security check point across the street at the lot entrance. They were scanning primarily for cell phones and other obvious items. It was painless primarily because we opted to leave our cell phones in the car. That’s why there aren’t any pictures of our event as cell phones and cameras were not allowed on the stage so leaving them in your car is the best bet. From there we started walking towards the center of the lot. Big Bang tapes on Stage 25 which is close to the middle of the lot. About half way there they stopped at the restrooms so anyone who had to go had a chance to go. Once you were on the sound stage going to the bathroom meant a long walk. From there we continued on to the stage. On each of the sound stages at Warner Bros. they have a plaque so you can see what movies and TV shows have been shot on each stage. Of note on Stage 25 were most of the Batman movies and the original V from 1985-1986. V has made a recent comeback on ABC, another show I like to watch. Across the street from Stage 25 is Stage 24. Obvious I know but Stage 24 is where Friends was filmed and is appropriately named The Friends Stage. Upon arriving at the door to the sound stage we had to go through security again and another magnetometer. If you had your cell phone or a camera with you they required you to check it. Another good reason for leaving your phone in your car is that if you were not a VIP then you had to step out of line while they checked your phone which meant you might not get as good of a seat. Since we were VIP’s our seats were reserved. We entered the seating area and were directed to our seats. They had written Smith, Smith, and Payne on our seats using masking tape. It sounds like a new law firm but Smith and Smith is me and my wife and Payne is Donnie Payne, a good friend of ours who attending the taping with us. It is now around 5:30pm. We had seats in the center house left section in the second row on the aisle right in front of Penny’s apartment. They were good seats as several scenes in the episode take place in her apartment. Donnie and I spent the next hour looking around at all the technology on the sound stage. They had partitions blocking our view of the actual sets but we could see over the partitions to the lighting, rigs, and sound gear and we could look up at the rafters and other cabling and equipment over head. We also were able to see the sound booth and lighting booths. While we waited they had some music playing but it was fairly relaxed. Around 6pm they told us they were going to show us an episode of the show that had yet to be aired. It was still a rough edit with a few sound issues and with the time code still on all the shots but nonetheless it was an un-aired episode and we were going to be the first to see it. At that time we were not sure why they were showing us an un-aired episode. Usually they just show one that has already aired but we didn’t care. The episode they showed us was titled The Pants Alternative which airs tonight, 3/22 at 9:30/8:30pm on CBS. If you like the X-Men you will love this episode. It also shows a side of geeks that most geeks would not admit to. At 6:30pm they started shooting The Spaghetti Catalyst, the official title of the episode. The emcee introduced him and the cast and off we went after the actress who plays Penny came out to talk to audience. She told us that in order for the episode we were about to see taped to make sense to us we had to know that Leonard and Penny breakup. This breakup happens sometime between the un-aired episode they showed us that airs tonight and the episode we saw filmed. I’m guessing that the breakup happens in the episode that will air prior to the one we saw taped. If you have never been to a TV sitcom filming here is how it goes. They shoot each scene 2-3 times. Often times they change lines between takes based on the audience response and they obviously repeat any bloopers that may have happened. Sometimes they will shoot them another time to get additional camera angles as well. For continuity for the audience they shoot the show in scene order. Each time they move from one set to another there is a lot of down time but they do this for the studio audience. It would be much easier to shoot all the scenes on a single set at one time rather than move around. Each time they moved from one set to another they used partitions to block the sets that were not in use. Sometimes they pre-shoot scenes as well. During our episode there is an outside scene that was pre-shot. At the proper time during the taping they played it back for us so they could record the laughter. The emcee’s job is to keep the audience energy level up and to keep you entertained as sometime the amount of time between takes can be 20-30 minutes. He gave away candy, $20, and did a lot of contests to keep the audience entertained. It was fun for a while but as the night wore on it got a bit old. I understand what he was doing and why they wanted to keep the energy level up but after a while I was ready for some quiet. They were always playing music and while I didn’t mind the music I wondered how the folks on the set were able to get anything done due to all the noise the audience was making and with the music playing . 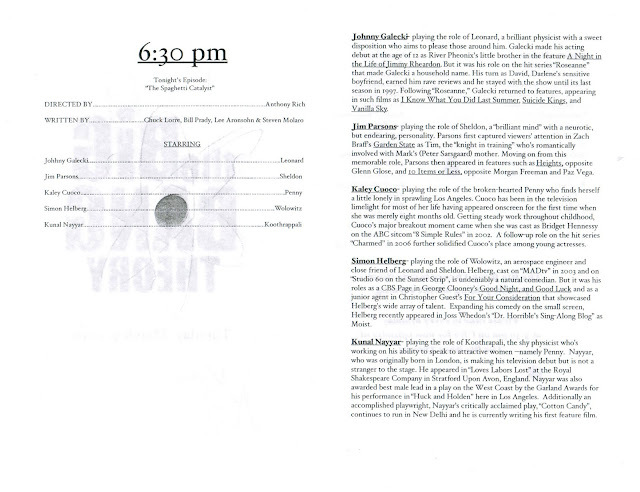 How they rewrote lines, received instructions from the director, fixed lighting issues, etc. with all that noise is beyond me but those on the stage seemed to enjoy it. The actors were often dancing around to the music between takes. I was expecting the taping to have more bloopers and be more relaxed however compared to other tapings I’ve been to this one was pretty rigid. The actors took goofs and flubs seriously. There was not a lot of clowning around on the set. During one scene Sheldon and Penny are coming up the stairs with Penny carrying a bag of groceries. The actress slipped on one of the steps so they had to redo the scene. Before the director yelled “action” the actress playing Penny turned to the actor playing Sheldon and said, “Don’t push me this time.” We loved it and thought it was funny but the actor playing Sheldon didn’t appear to enjoy it. When they goofed many of the actors would apologize and we would start over again right away. They didn’t elaborate or have fun with it. Seeing as the show is so funny I would have thought that they would have messed around a bit more. Perhaps it is due to the highly technical dialogue that keeps them from playing around too much. Either way, we still had a good time despite the lack of antics on the set. As we got down to the final scenes Chuck Lorre, one of the creators and executive producers came out to talk to the audience. He said they are often criticized for using a laugh track for the show due to the sophisticated science jokes and humor. 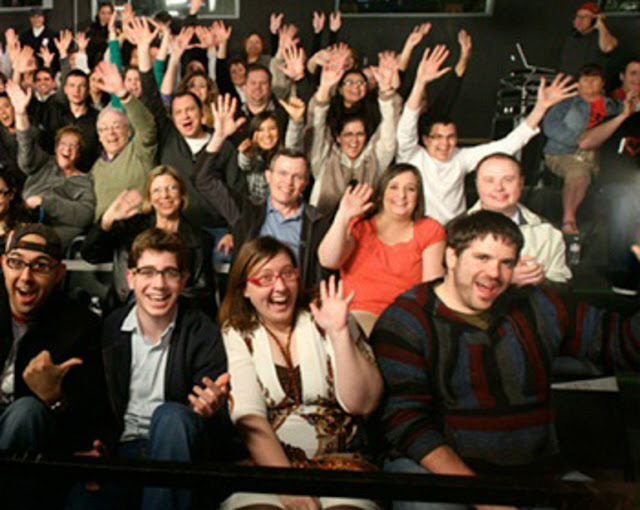 He said in order to show that they use a live studio audience they were going to include a shot of the audience in an upcoming episode. Come to find out it is The Pant Alternative episode that airs tonight. This explains why they showed us an un-aired episode. They brought out some lights and cameras and filmed the audience in sections to appear as part of the vanity card at the end of the show. 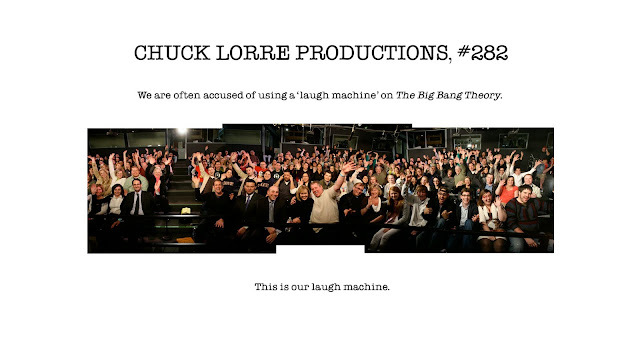 The vanity card is normally a white screen with black text containing very funny writing by Chuck Lorre. This appears for all shows that he has created. For tonight’s episode the shots of the audience is what will appear in this spot for about a second, maybe two at the very end of the show just before CSI: Miami starts. After our moment in front of the camera they went back to filming the final 2 scenes. Once they were done they came back and told us they needed to shoot the audience images again because they needed more light. This time they brought in a large lighting rig and really lit the audience. The camera came back and we shot it again. This time Chuck Lorre was standing a few feet away from where I was sitting really encouraging the audience for this second take. After our second moment in front of the cameras passed they did the final curtain call and that was it. It was around 10:15pm. One of the actors stayed around and signed a few autographs but for the most part they split. 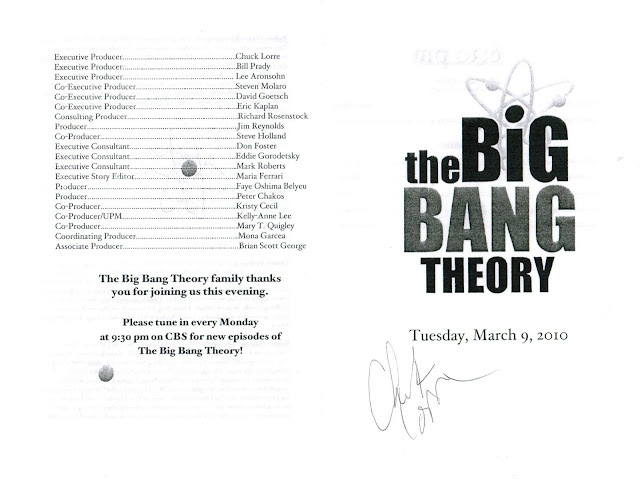 Chuck Lorre was still standing near to us and Donnie got his autograph. We hung around until they made us leave looking at various things and checking out some of the other sets we couldn’t see as well from our seats. It was around 10:45pm by the time we got back to our car and headed to the hotel. We are not sure when The Spaghetti Catalyst airs. They film their final episode of the season on April 6 so I’m guessing it airs sometime in late April or early May. If you follow Bill Prady, one of the other creators and producers on Twitter you can find out a lot of behind the scenes info about the show. He tweeted this week that they have been picked up for a 4th season and begin production in August. There is more I could say and probably will in future blog posts but this gets the story started. We also attended a taping of The New Adventures of Old Christine. While I like The Big Bang Theory better I enjoyed the taping experience more for New Christine. More to come I’m sure as this post is already quite long. I've posted a Q&A list to go along with this post and hopefully answer some additional questions. I’m in Memphis this week for some meeting at Shelby Systems while Donnie attends the basic Shelby training as part of his ramp up at Faith. Last night we picked up a rental car and the Memphis airport. While driving to the hotel I noticed the compass on the dash said CAL. Being a bit of a geek I knew that meant the compass in the car had not been calibrated. The upshot is that means the car is very new and I’m one of the first renters, the downside is that CAL was going to drive me nuts knowing that the car wasn’t doing something I know it could do – namely showing me what direction I’m going. I know my GPS tells me the direction but it’s the principle of the thing. We checked into the hotel and then ran out to grab a bit to eat. On the way back from eating Donnie suggested I go ahead and calibrate the compass. To calibrate the compass in a GM model car you select calibrate on the dash board menu and then drive in circles for it to calibrate it. I’m not joking, look it up in any GM manual. On the way back to the hotel we found an empty mall parking lot and gave it a go. So I started driving in circles, slow enough that I didn’t make Donnie sick. First I tried small circles to the left, then larger circles to the left, then small circles to the right, then larger circles to the right and finally I did some figure 8’s. All the while the dash kept reading, “Drive in Circles”. 5 minutes later I finally realized that the zone must not be set. In order for the compass to calibrate you have to know what zone you are in so the compass can calculate the magnetic north based on your longitude and latitude and let you know your direction in reference to the magnetic north. How do I know this? Like I said, I’m a bit of a geek. Because of that inherent geekness I also happened to know that Indiana is in zone 5 and that Memphis, TN is also in zone 5 as it is almost due south of Lafayette, IN. So, I set the compass zone to 5 and started driving in circles again. By this time mall security had noticed something odd with a car driving round and round and round in their parking lot. I completed my first circle after setting the zone and the dashboard displayed those magic words, “Compass Calibrated” and the letter SE appeared in place of the CAL. Also at this time a mall security vehicle appeared next to ours. He wished us a good evening and said he was glad his boss didn’t notice us and sent us on our way. I’m not sure what that meant but I’m glad our compass is calibrated. I don’t plan charge Enterprise for the services performed.